Our range of products include portable gazebo tent, gazebo tent, promotional gazebo tent and outdoor gazebo tent (heavy). Portable Gazebo Tent is an outdoor Promotional tent which allows you to display your products in outdoors and exibitions as well. We have in-store for our customers a wide range of Gazebo Tents our esteemed patrons. The Gazebo we offer is highly applauded for qualities such as nettled nature and tough & corrosion resistant. These products are available in different shapes, sizes & dimensions and clients can customize them as per their specification. Moreover, we are offering the economical range to our esteemed patrons. 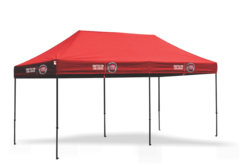 The Promotional Gazebo Tent will be made up of Imported UV protected waterproof Oxford / PVC coated Tetrone in any desired colour of your choice. The tent will consist of 4 top cones & 4 top facias. The tent will be put over a white powder coated Steel frame, made in sections for easy packing & carrying. The height of the tent can be adjusted as per your requirement in any 1 of 3 available options. The top 4 cones & top facias will have screen printing done as per your design ( no visuals / images ). 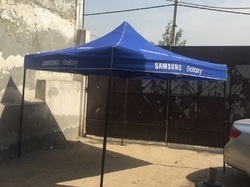 We are offering Outdoor Gazebo Tent (Heavy) to our client. Packaging Details: Each piece is securely packed in a carton box.